The E750 is the most powerful of the models from Currie Technologies E-zip line-up and it delivers a very comfortable ride. It is called the E750 because it boasts a 750W motor which has a lot more power compared to their earlier models, the E450 or the E500. 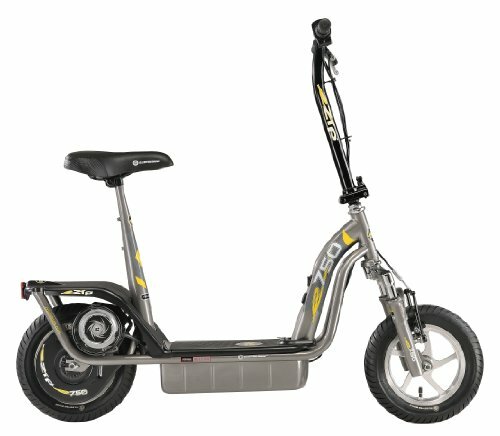 The E-zip scooters are known for their comfort and have become very popular among adults who are looking for a more stable and durable ride but don’t need premium performance, nor want to pay a premium price. 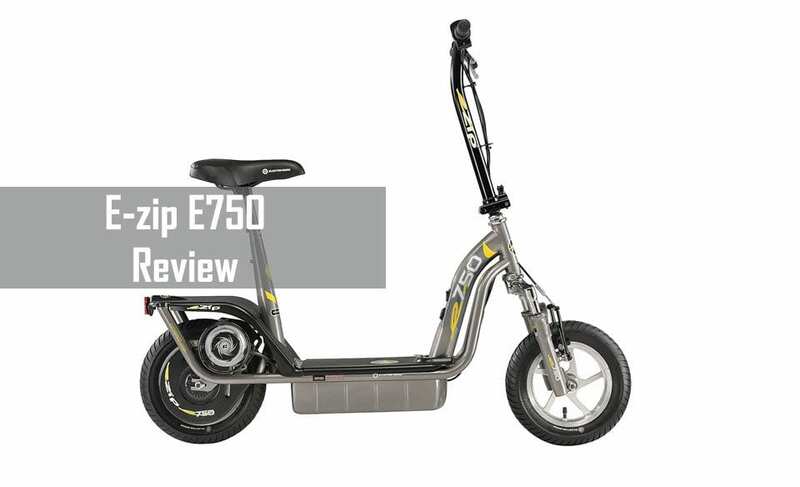 As I said the E-zip E750 has a larger motor of 750W which is said to be able to accommodate a rider of up to 260 lbs. It has a chain-driven motor that is mounted outside of the rear wheel and can easily be replaced if you would ever need to. The motor is powered by two SLA connected 12V/12Ah batteries giving you a total power of 24V at your disposal. The scooter has a top speed of 15 mph and on a good day, you can ride for up to 12 miles on a fully charged battery. Something to keep in mind is that this scooter has been around for ages and has seen some small upgrades throughout the years. It is still a very viable scooter option, but there are more affordable models available with similar performance. You can check these out if you want something less pricey. It is equipped with a seat which can be easily disconnected at will and two 12.5” bike-like tires provide superior comfort and smooth turning just like on a regular bike. The front fork has a built-in suspension and oversteering kit, which means more comfort and no risk of oversteering while turning. It is a heavy model of 60 lbs so you will probably do good not to carry this unit around. Even loading it into a car could be a bit of a workout session, especially if you have a smaller one. If it doesn’t fit in your car you can fold down the handlebar and disconnect the seat to make it take up less space. The frame and parts are all made out of high-quality material and the support has been nothing other than friendly and helpful the few times I’ve contacted them with my stupid questions just to see how they would handle it. Also I found this hilarious video from Scoots of Anarchy while researching and I couldn’t just leave it out. Enjoy! The E750 gives you a very comfortable ride through the city. As long as there are no major potholes the front shock, seat and excellent 12.5" pneumatic bike tires give you a smooth and comfortable ride. It can accompany adults up to 260 lbs and has enough power to combat smaller hills without any issues with my 178 lbs on it. In terms of riding the currie E750 does not show any weaknesses when it comes to power. It takes me up all the hills in my neighborhood without any issues and I weigh 178 lbs so that’s a good indicator of how strong the motor is. I think the motor is a bit noisy but that’s something you have to live with when choosing a chain-driven motor instead of a hub motor scooter. It does get a bit bumpy, even with the inflatable tires and front suspension the seat is too hard for my liking and it gets a bit uncomfortable while riding on uneven terrain or on a street with potholes. Which is always the case with the streets in Sweden after a really cold winter. The brakes work very well and you will definitely be familiar with the design as the brakes are of the same model as most bicycle hand brakes. Friendly reminder, its front brake only so no panic braking. Overall I would say it is a great scooter. Sure the ride might get a bit bumpy, but it’s nothing compared to the lighter models with solid rubber tires available today. Quality throughout the entire scooter and you will definitely not be disappointed with the speed, power, and distance of the E750. If you need more power and durability I would recommend you to have a look at the Qiewa Qmini. A seat that can be easily disconnected at will. The handlebar can be folded to ease with transportation. Large bike-like tires for superior comfort and shock reduction. A front shock that also aids in providing you with a smoother ride. 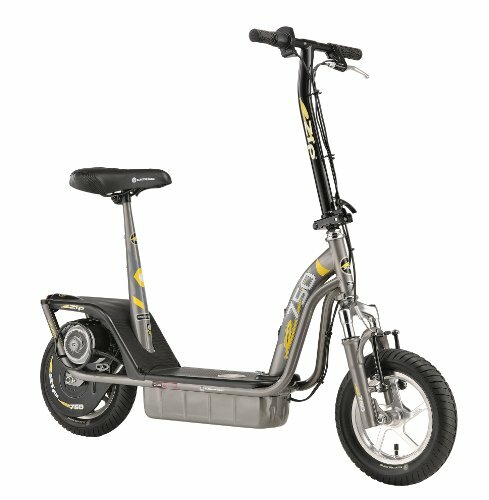 Th Currie Technologies E-zip E750 is a great scooter and the most powerful model in the E-zip family. It can aid heavy users and is built to last the test of time without you having to worry too much about maintenance. It reminds me a bit of when I took the E300 for its first spin. A lot of scooter for your money that will provide you with an excellent option for city commuting those shorter distances. Make sure you have enough space to park it somewhere or that your home has an elevator because this thing is a bit on the heavy side. Gotrax Glider Cadet Review - Solid buy for the youngest riders?